Page through a wonderful – and wonderfully romantic – set of Victorian era paintings of mainly fishing boats using the little arrows on the left and right of each frame. Read about Charles Napier Hemy here. There are many more paintings here, here and here. 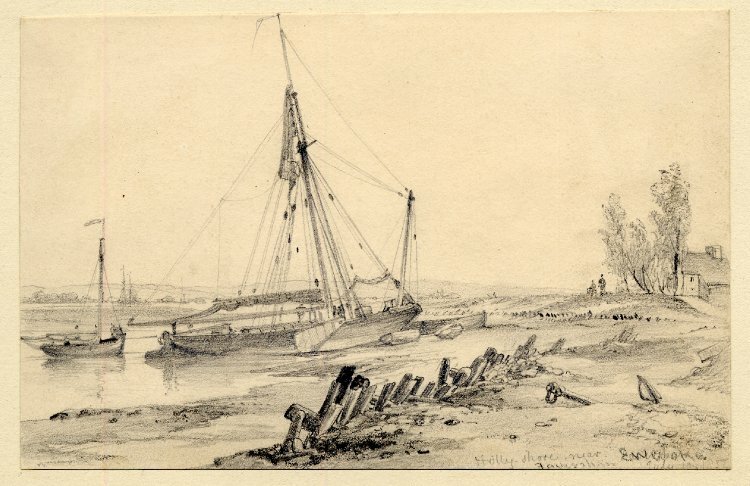 Following the recent post about EW Cooke, Faversham historian Arthur Percival has alerted me to the existence of this Cooke drawing of the scene at Holly Shore on Oare Creek – this is the spot we now know as Hollowshore. This low-resolution image is all I’ve been able to get hold of up to now – the original is held by the British Museum but I have not been able to find a record of it on the museum website. The entrance to Oare Creek and the Shipwright’s Arms will be familiar to anyone who has visited. The barge itself is of the old swim-headed type from long before the Henry Dodd established sailing barge races in the 1860s. A long-standing fan of EW Cooke’s work, Mr Percival says the artist visited the area on the 9th July 1832. Another find from searching the Internet is the image below of a sailing barge loaded with hay with a retired man of war in the background. I think this is very likely to depict a scene on the Medway, and is therefore of particular interest to those of us who sail in the area. The man of war with its masts cut down is clearly not a prison hulk, because they were closed down a few years before EW’s visit. The image of the hay barge is a thumbnail from the Magnolia Box prints and pictures website, which offers the image in various sizes – the title given is ‘Hay Barge and Men of War on the Medway, 1833’. Cooke clearly had a particular interest in hay barges – there’s another similar scene of a hay barge in still weather being handled under sweeps off Greenwich here.